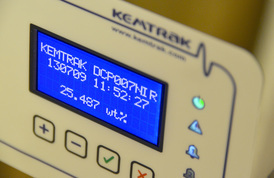 Kemtrak photometers are ideally suited to the needs of the chemical industry. Simple to use and zero maintenance. Robust industrial measurement cells that can withstand high temperatures, pressures and explosive environments. The most demanding applications are no problems. Efficient chemical use through process photometry can reduce costs, increase quality and assure environmental compliance. Hazen (APHA) is a measure of yellowness originally designed to evaluate the colour of near-colourless waste waters by visual comparison with a platinum-cobalt (PtCo) stock solution. Iodine colour ranges from yellow to brown defined by specified dilutions of an iodine solution. Used for solvents, plastics, resins, oils and fatty acids. Saybolt (ASTM) covers the determination of the colour of refined oils such as undyed motor and aviation gasoline, jet propulsion fuels, naphthas and kerosene, and in addition, petroleum waxes and pharmaceutical white oils. The Kemtrak DCP007 LED process photometer with in-line measurement cell can instantly detect minute changes in colour that is beyond the sensitivity of the human eye and will furthermore eliminate operator interpretation errors. Proven applications include acetone, isopropyl benzene, propane, tetrahydrofuran, methyl-isobutyl ketone in addition to fuels such as petroleum and aviation gasoline / jet fuel. Additionally, water can be measured in alcohols, such as methanol and ethanol, from trace amount to pure water. The Kemtrak DCP007-NIR LED process photomter is well suited for the detection of water in hydrocarbons. Automatic compensation turbidity and/or fouling of the optical windows ensures trouble free operation. 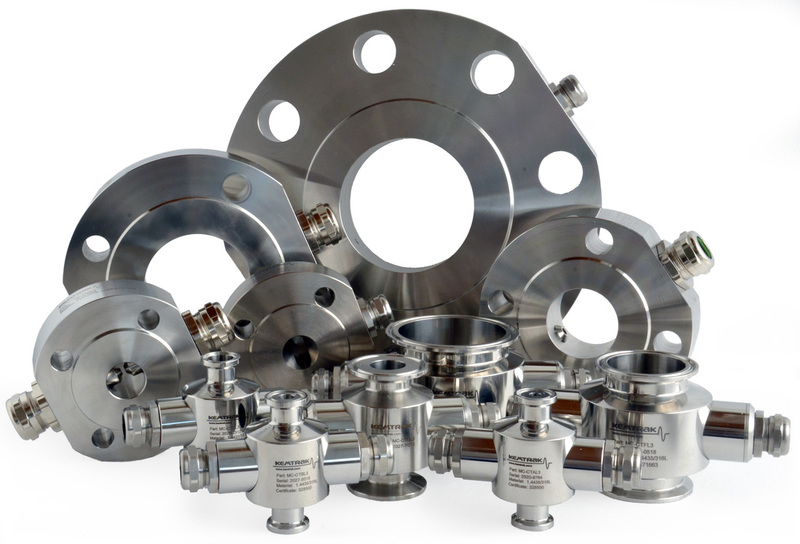 Kemtrak offers a comprehensive range of flow-cell manifolds that can be certified for explosive environments (ATEX). 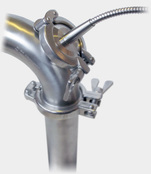 Wherever a second fluid is used to heat or cool a process, a risk of product leakage or carryover exists. Leak detection in process equipment such as heat exchangers and boilers are a vital part of safeguarding a chemical process. 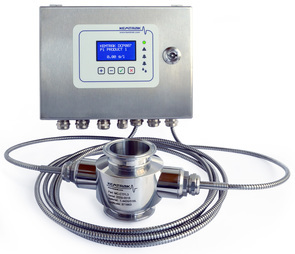 Immediate detection of leakage or carryover can be achieved by installing a Kemtrak photometer on the condensate line. From a continuous monitoring of the process water for signs of contamination, conservation of water, energy and treatment chemicals is the result. The net benefit is a reduction in operating costs. Kemtrak in-line photometry is used in the food and beverage industry to monitor and improve product quality and consistency while reducing costs in the manufacturing process. 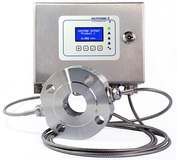 Kemtrak in-line photometers for food and beverage applications use measurement cells and probes designed for sanitary use and will withstand the temperatures, pressures and conditions necessary for processing and CIP cycles. The NBP007 probe can see where other instruments can't. The Kemtrak NBP007 is an optical in-line analyzer suitable for continuous total solids content monitoring of dairy products including milk, cream and cultured dairy products such as yoghurt and cream cheese. Kemtrak photometers have many uses throughout a refinery where precise in-line concentration measurements of liquids and gasses are required. Kemtrak photometers use industrial grade fiber optics (steel jacketing) to pipe light from the analyzer to an industry standard measurement cell. Kemtrak measurement cells are ideally suited for the most hazardous explosive atmospheres as they contain no electricity, moving parts or source of heat. Efficient process control using in-line photometry can reduce environmental emissions and running costs. 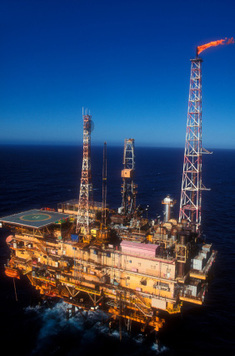 From a better understanding of the process, maintenance costs and downtime can also be reduced. Crude oil is a yellow-to-black liquid consisting of hydrocarbons of various molecular weights and other liquid organic compounds. Crude oil will not mix with water, however under turbid conditions crude oil will form an oil-in-water emulsion with a turbidity proportional to the oil concentration. The Kemtrak DCP007-NIR LED process photomter is well suited for the detection of water in hydrocarbons. The Kemtrak DCP007-NIR uses a long life high performance NIR LED light source with robust industrial grade fiber optics to provide drift and noise-free measurement with very high precision. Automatic compensation for sample turbidity and/or fouling of the optical windows ensures trouble free operation. The measurement of water in hydrocarbon solvents and gasses is an important measurement in the petrochemical industry. The use of near-infrared (NIR) spectroscopy for water analysis is common as NIR offers high sensitivity and measurements can be undertaken in-line providing immediate results. A Kemtrak DCP007-NIR LED process photometer can be used for measuring water in oil, LNG and fuels such as petroleum and aviation gasoline / jet fuel. 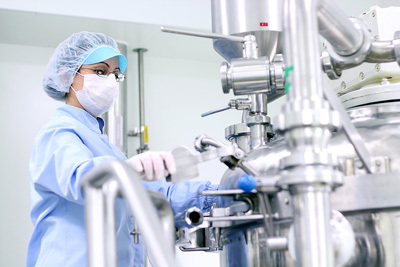 Kemtrak in-line photometers are ideally suited to the needs of the Pharmaceutical & Biochemical industries. Use of in-line process photometry can reduce costs, increase quality and ensure environmental and regulatory compliance.